Source: screen shot from Zeekler site. The structure of Zeek and precisely what it does are just plain baffling. Even so, it appears to have a legion of loyal followers, including followers on well-known Ponzi forums such as MoneyMakerGroup and TalkGold. The Ponzi-board presence of Zeek affiliates is potentially problematic in the sense that some of them also are pushing obvious fraud schemes such as JSS Tripler/JustBeenPaid, which advertises a return of 60 percent a month and does not disclose its base of operations. “I am sorry to bring it up to you, but every business is a ponzi online or not,” poster “masikk08” wrote in response to “Lynndel’s” pointed criticism of JSS/JBP. Let’s stop for a moment to assess what we just read: A JSS/JBP “defender” who’s also a Zeek affiliate just told you that “every business” is a Ponzi scheme. Those words from your potential Zeek sponsor are just plain absurd. They also are devoid of any real-world understanding of the Ponzi menace. Ponzis have put people out of their homes, ruined lives, caused divorces, caused bankruptcies, destroyed college plans and dreams of passing on money to children and caused or contributed to suicides. A number of Ponzi/pyramid-related, murder-for-hire plots have been investigated. A California man believed to have used his ecommerce platform to facilitate Ponzi schemes has been sentenced to death for arranging the contract slaying of his wife, a potential witness against him. “Every business makes money off of new customers and nothing lasts forever either,” the MoneyMakerGroup poster and Zeek affiliate continued, mixing an irrelevant point with a bromide. Let’s assess those words: That people are getting paid is not evidence that no underlying crime exists. Successful Ponzis always pay. Bernard Madoff “paid” — right up until the day he didn’t. Below the post, “masikk08” used an all-caps headline to attract attention to Zeek: “I HAVE A GIFT FOR YOU,” the headline reads. When the link is clicked, it resolves to a Zeek page. Given that we’re approaching May 2012, it appears as though the giveaway has been extended well into 2012. Some JSS/JBP affiliates came under fire in January by CONSOB, the Italian securities regulator. From a U.S. perspective, both JSS/JBP and Zeek are using offshore payment processors. This, coupled with the Ponzi-board presence and the processors’ histories of enabling investment scams, could mean that money “earned” in one or more scam “programs” is passing through Zeek. From the tempting-fate department, Zeek and its affiliates, using photos of U.S. currency, also advertise what effectively are auctions for sums of U.S. cash — all while affiliates laud the “program” for providing a return. These things easily could catch the attention of the Treasury Department’s Office of the Comptroller of the Currency, not to mention the SEC and potentially even the CFTC and the FTC. Bidders potentially could receive substantial sums of cash at a significant discount. There is a certain incongruity about this, perhaps particularly in the sense that the cash auctions create the appearance that U.S. currency is being used as bait and potentially as a loss leader. But the strangest thing of all is that successful bidders apparently have the option of receiving the full value of the U.S. currency via AlertPay or SolidTrustPay, both of which are based in Canada and both of which are friendly to fraud schemes. This opens the door to questions such as these: What registrations, if any, with which regulators in which countries does Zeek require — and does it have them? Which agency is its principal regulator? If a successful bidder pays less than the face value of the U.S. currency, is Zeek eating the loss? Is Zeek buying currency in bulk — or is it simply divining a sum available for bid and debiting its own bank or processing account for that sum when it sends the electronic equivalent of that sum to the successful bidder via the offshore processors? Is Zeek selling U.S. currency at a loss or at a profit? If at a loss, why? If at a profit, how? Is there a risk to the U.S. and the currency markets if other “opportunities” model Zeek? As time allows, we’ll add to our coverage of Zeek. We’re reading a lot about it from a variety of sources. The source volume and competing claims about the “program” create an atmosphere of confusion, and the overall Zeek “story” is far from clear. For the purposes of this column, we’ll raise one final point: AdSurfDaily, which prosecutors have described as an international Ponzi scheme that operated over the Internet and plucked at least $110 million, once spouted that it would try to incorporate an auction arm of some sort. That arm never materialized. Zeek appears to have ASD-like elements, leading to questions about whether regulators could become concerned that Zeek was selling unregistered securities as investment contracts and using wordplay to mask an investment program as something else. ASD’s auction dream was speculative at best. Our initial take on Zeek is that it shared ASD’s now-ancient dream — indeed, other MLM’s have had the same dream — but Zeek actually put the dream into action. The question is whether that dream is compliant with any number of regulations that could come into play — or whether Zeek jumped the gun and now is trying to become compliant after the fact and after gathering an unknown sum of money while operating unlawfully. Lots of people — perhaps millions — support MLM in one form or another. It is virtually impossible to quantify all of the disingenuous presentations, which often are hyperbolic — if not completely over-the-top. A certain sphere within the MLM universe is dominated by hucksters. These hucksters often display a remarkable lack of awareness. Some of them are tone-deaf politically and have a tin ear for real-world PR. So, for the purpose of this first column on Zeek, we leave you with two questions: If you place a successful bid for a sum of U.S. currency on Zeekler, do you have any legal or political concerns if your cash equivalent is delivered via an offshore processor that has processed payments for one scam or collapsed scheme after another? And why can’t you get your money through PayPal? If Zeek “sells” $100 cash, for $50, they make serious bank. Each bid costs a dollar, and the bid goes up one cent from the last one, so a $50 bod had 4,999 bids before it, at a dollar each. The shame is when you win, you still have to pay $50 for the cash! Go figure. I guess it’s legal as far as it goes, but since the auction “ends” at a more or less random time, I can’t figure out how they get around gaming regulations, seems to me like it’s nothing more than a privatre lottery. Slight correction, Patrick. Oz’s full handle is “Ozsoapbox”. And since you brought up Adsurfdaily, I need to point out one MORE similarity between ASD and Zeek. ASD’s defense attorney once claimed in court, in order to have case dismissed, that ASD is NOT an investment because the participants are required to perform an action, i.e. click on ads, to get paid. It is not simply “put money in, get money out”. That notion was shot down in court. Zeek’s model is you put money in (exchange money for bids / VIP points), then each day, to qualify for “profit share”, you have to post an ad of Zeek somewhere (and you need to have recruited at least two paying members). Then you can get a “share” of profits, usually 1.4 to 1.5%, based on how many “VIP Points” you hold. The profit can be reinvested or cashed. So if you have 1000 VIP points (you can accumulate that by recruiting or buying bids yourself to be given away), you get 14 points, which can be added to your VIP points (so you have 1014), or cashed as $14 check. Points have a “life” of 90 days. In February 2012, Zeek hired a bunch of MLM big shots (Nehra, Grimes, Laggos, etc.) who quickly instituted some changes: STOP REFERRING TO ZEEKREWARDS AS AN INVESTMENT. However, it is clear from their comp plan that ZeekRewards values your money, that you need to put money in (as bids), then keep it in (reinvestment) and don’t take any out and the balance will grow. It, in all aspects, is an investment. b) ADS case have shown that court does NOT accept “simple meaningless work”, like click on an ad, and I am NOT SURE how the court will rule about Zeek’s “posting ONE ad per day on free classified sites”, but I suspect that court will NOT rule favorably (toward Zeek) on that either. 1) You are required to put money in, do minimal / meaningless work, recruit people to get paid. 3) If you consider that you get a “return” based on money you put in, not by the work you do, it is an investment, yet they insist they are NOT investment. Any way you dice it, ZeekRewards is one shady enterprise. And some of the auctions are positively ridiculous. I’ve seen one case where the winner spend 1410 bids for $100 cash. That’s right, one thousand four hundred and ten bids, just from that one person (not counting all the other bids submitted) to win $100 cash. My prediction, either a whole bunch of high level MLM experts are going to wind up with egg on their face from this one or Paul Burks will win the Nobel Prize for economics. Here’s something I find interesting, the “winner’s circle” link on the Zeek site, it lists the winners of recent auctions. Almost every time I’ve looked at it there were more than one auction listed where the final winning price of the auction plus the price of the bids cast only by the winner were far higher than the listed value of the item sold. In fact it isn’t all that unusual to see auctions won where the price of the total number of bids cast by the eventual winner was higher than the auction items value even before they pay for it. Yes, Zeek affiliates purchase bid packs to earn VIP points and they can use these bids themselves or give them out free as a recruiting tool. This leads to a surplus number of bids and a finite number of auctions to use them in. So any person casting bids which cost them 65 cents each is at a huge disadvantage to people bidding on the same item but either were given those bids free of who got them at a functional discount (with residuals). But those VIP bids are canceled out of the system as they are used, in fact I bet it looks just like a retail sale as each of those 65 cent bids get added to Zeek’s bottom line. Zeek is claiming to be debt free, that all it’s “rewards” are paid out of daily revenue (just like ASD) and also like ASD, days where evil hackers keep the website offline do not interfere with that days revenue share, it doesn’t even lower that days ROI. Either Zeek Rewards is a truly new and completely unique kind of online program which can legally and mathematically sustain a 1.4% ROI per day, or they put more lipstick on the same old pig than anyone since Tammy Faye Baker. The same Keith Laggos who had a judgment and fine by the courts in August of 2005 for SEC security violations. This was in regard to the TeleWrx/Converge articles he wrote failing to disclose he was compensated to write his glowing testimonials of them. Yep, a real MLM expert he is. Is his Money Maker Monthly still being published? Actually I was shocked he was not chosen to host “The Price Is Right” when they were looking for a replacement for Bob Barker. GlimDropper: Zeek seems to be hitting critical mass. Their 2011 income disclosure indicates just under 60 million in payouts to US affiliates, they’re getting into big boy money. However, the IDS did not indicate at all how much money was SPENT by the same affiliates as bid purchases and monthly membership fees. I suspect most of the $60 million paid out would be offset by bid purchases. Which brings up another problem, as Zeek brought in Kaplan, the tax guy, who IMPLIED (he kept saying vague things) that bid purchases can be deducted as “business expense” on US tax returns. I hope that the affiliates don’t get hit by audits. Another thing: it’s documented that the top executives, esp. Dawn, are active members in ZeekRewards. Now tell me, doesn’t that hit an ethical alarm bell in your head? It’s also interesting that a bunch of Zeek defenders are trotting out that exact argument in reverse: that Zeek have to be legitimate to have hired all these guys for compliance, as these guys are so upstanding they can’t be working for a scam. After the Gerry Nehra debacle in the Federal Court, when he appeared as an expert witness for ASD and accidently proved the case for the prosecution, the expression “expert” is highly dubious. The definition of “legal expert” in the MLM trade begins to look more like “paid shill”. Does the name Larry Friedman ring any bells? Or as they say – expert? schmexpert. Nehra *is* an MLM expert, but he’s not about to perjure himself on the stand. by insisting on something that wasn’t true. K. Chang: Nehra *is* an MLM expert, but he’s not about to perjure himself on the stand. by insisting on something that wasn’t true. Sure he is. He did it in the ASD case. I don’t believe Mr. Nehra was alleged to have perjured himself in his testimony on ASD’s behalf but neither was his testimony helpful in rebutting the governments claim that ASD was a ponzi. Ditto, Glimdropper. Nehra basically made broad proclamations is not backed up by facts and/or is contradicted by the company’s own facts and/or that in-house attorney’s own testimony. K. Chang: Ditto, Glimdropper. Nehra basically made broad proclamations is not backed up by facts and/or is contradicted by the company’s own facts and/or that in-house attorney’s own testimony. But you are claiming he is an ‘expert’ and agrees this is not a scam. He’s as much an ‘expert’ as that dumbass clements. 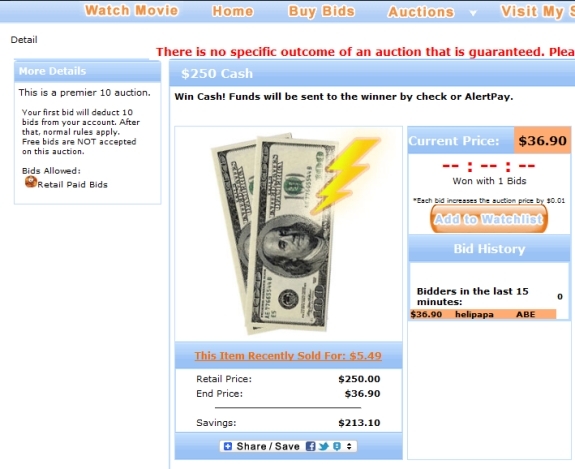 This brings up an additional issue: Zeek allows a bidder to “cash out” the item “won”, i.e. just send me the money, not the actual item. Doesn’t this ALSO would cause it to be regarded as an investment? IM (notvery)HO, your comment that “@Whip — even experts can go wrong. Nehra is an MLM expert.” Mr. Nehra and other experts who make statements and errors because they are “out of their depth” have certainly found a very lucrative way of doing it. Mr. Nehra’s supposed fee for his appearance in court in the ASD case alone was more than many hard working Americans earn in a year. Ditto, in the case of the ASD Members Business Association cause taken on by Mr. Larry Friedman. For that kind of money, they have plenty of possibilities to do their homework or due diligence or whatever you wish to call it. Of all the places in the world to not allow yourself to be caught “out of your depth” one would think a courtroom where the defendant is facing the loss of $90 million plus dollars AND you’re charging for your services would be right at the top of the list. Nehras’ expertise exists only in his own mind and in the self published PR releases consumed with relish by the MLM crowd. His big mistake was venturing out into the real world. But Zeek is lawyered up for a reason. It may have some ASD-like exposure under Howey and, as Gregg pointed out, there may be concerns about whether Zeek is conducting a lottery. The more I think about it, the more I’m convinced that Zeek is gonna have a problem saying it’s not gambling, and if I thought so, it’s not unlikely some State Attorney General of Prosecutor out there will come to the same conclusion. The real problem is how a purported auction ends. Not a set time like E-bay. And charging for “bids” looks pretty darn close to “selling tickets” to me. Toss in the MLM matrix like recruiting the sheer size of the whole thing, and I can see this ending very badly. Strangely enough, when automated bidding bots first appeared on E-Bay, I think they themselves had some concerns that they might be considered a lottery, and some changes in TOS were made to prevent the issue coming up. Surely if E-bay was worried about something they didn’t even initiate or have control over, and is far less obvious, then Zeek should at the very least be worried. BehindMLM is getting reports that some auctions are marked as “deleted” with no explanation. Speculations are running rampant, as with the previous bruhaha where zeek suddenly banned international affiliates (believed to be everybody from six countries, but NEVER confirmed by Zeek). As for the sudden banning, Burks himself proclaimed that it’s “banned countries” (didn’t say which ones), and claimed that some affiliates are sending money to the US affiliates to sign up, and that’s somehow against company policy. Doesn’t explain why that’s related to “banned countries”. The insulter, by the name of “steve”, has repeatedly thrown insults at everybody esp. Oz on BehindMLM, and it’s always emotion-based, not logic-based. Item of note: ZeekRewards, in their 2011 income disclosure statement, seem to imply that they have paid out over 60 MILLION dollars in 2011 to affiliates. I think you have to do some math though, number of affiliates * average earned and all that. That could potentially make it bigger than ASD. When ASD was stopped by the feds, feds froze and forfeited 55 million. For example, on or about October 9, 2006, BOWDOIN sent and caused to be sent an electronic mail communication in which Bowdoin wrote, “[l]et’s don’t [sic] use the words investment and returns. Instead lets [sic] use ad sales and surfing commissions. And guess what do we find on ZeekReward’s compliance? DISCLAIMER: IF YOU MAKE A PURCHASE FROM ZEEKREWARDS YOU ARE PURCHASING A SUBSCRIPTION FOR A PREMIUM BUSINESS CENTER OR YOU ARE PURCHASING BIDS. YOU ARE NOT PURCHASING STOCK OR ANY OTHER FORM OF “INVESTMENT” OR EQUITY. YOU MUST ACTUALLY USE THE BIDS THAT YOU PURCHASE OR GIVE THEM AWAY AS SAMPLES TO HELP GROW YOUR BUSINESS. AFFILIATES WHO PRESENT OUR PRODUCTS TO OTHERS IN A MISLEADING MANNER OR IN A WAY THAT LEADS THE BUYER TO BELIEVE HE OR SHE IS MAKING AN INVESTMENT OR PURCHASING EQUITIES WILL BE TERMINATED AND ALL COMMISSIONS AND AWARDS WILL BE FORFEITED. BUYERS MUST READ THE ENTIRE HOW IT WORKS AND GET PAID PAGES ON THE ZEEKREWARDS WEBSITE AND THE LEGAL DISCLAIMERS. PLEASE NOTE THAT DAILY REBATE PERCENTAGES WILL VARY DAILY AND WE DO NOT GUARANTEE ANY SPECIFIC AMOUNTS OR RESULTS. Even the word “rebate” is eeriely familiar… Isn’t that what ASD called its ROI? Weird, official disclaimer doesn’t have that final sentence regarding “rebates”. However, lawyers are requiring folks to read aloud the disclaimer up to that final sentence. Darn it, looks like that affiliate embellished the disclaimer. Phooey. I guess anything that actually works for the masses and is ‘compliant’ is bad news for the authorities. So I predict the noose will tighten even more with even more ‘compliance’ until it only works for a few. Keep in mind 98@ of people can’t sell or recruit, which is why this is so popular. Based on calculations from 2011 IDS of zeekrewards, they paid out 58.5 million to members. Unfortunately, it is impossible to tell how many “real customers” are there in the business, or are members buying bids in hopes of getting more profit share, so members are paying other members. However, the fact that only 23.99% of members are “active”, would suggest that AT THE MINIMUM 76% of members suffered a net loss due to buying bids and giving them away for VIP Points. The reality is probably a bit higher , perhaps as high as 85%. It appears that the alleged compliance package from Kevin Grimes never materialized. Some changes were made, no idea from who, may have been Gerald Nehra or even Laggos. Supposedly they also hired ex-SEC folks, but so far it fits every part of the Howey Test as investment. Further, the income disclosure statement gives no indication of either Zeeks’ income, it’s income source or the percentage of “payments” made solely from members’ fees. They have about 15000 active members, comprising of 24% of members, so total membership is 68000 or so. Using $35 per member, membership dues ANNUAL intake is 28.5 million. As they claim that they paid out HALF of their profits, their “gross profit” is double of 58.5, or 117 million. Thus, logically 88.5 million “profit” came from bid purchases. Now here’s the question: how many of those bid purchases (136 million bids) are made by “real customers” (i.e. not affiliate, or shill accounts created by affiliates)? Checking some of their tax math shows that they issue 1099 in amounts far in excess of any actual cash received by the affiliates, as they count every penny of “profitshare” as income, but you only actually receive the “cash out” amount , which is often only 20-30% of the profitshare. Their explanation is all of profitshare is income, whether you reinvest it or not. So if you have 5700 points of profitshare all year, and only did 20/80 cash out, you only got 1100 in cash, but have to pay taxes on 5700. If you are in the 25% tax bracket, you actually LOST money, as the cash you received is not even enough to pay the taxes! This leads to Zeekheads to claim all sorts of deductions to try to ‘reduce’ their “income”, such as claiming the “expired points” as “allowance” in Line 2, Schedule C (which is UNUSED, according to IRS rules for 2012!) or “bid purchases” as “business expense”, when they are simply traded for VIP Profitpoints! This is going to trigger all sorts of audit at IRS. And even after the deduction (maybe 2500 points expired in the scenario above, assume it was NOT rejected by IRS) the net income is only 3500-3800 and taxes is like 850 or so (25% tax bracket) with only 1100 cash to pay it. Come to think of it, IRS only allows $25 per person maximum gift expense deduction. Unless Zeekheads can prove the bid repurchases are given to X number of individuals it can’t count as gift expense! Furthermore, as virtually ALL expenses are in form of these ‘gift expense’, which outweighs even the income, this is a surefire audit trigger. Maybe the gift idea doesn’t apply, (gift is given to “existing” customers) but it does NOT look good to the IRS when Zeekheads are claiming promotional expense of all the bid purchases (and reinvestment/repurchase) to the tune of 5-6000 (in the scenario above) while the “profit” is merely 1000 or so, when it really should be the other way around. I’ve been reading the comments and I’m starting to agree. When I first joined Zeek Rewards, I was afraid that they might be a ponzi scheme…paying out so much money you know. But I emailed their contact number and asked that question. I received a reply from affiliate support…”It is not a ponzi scheme because we pay our affiliates to advertise”. So I dived in. At first everything seem to be OK. Now they can’t bill our cc for our subscriptions ( and I don’t understand why), the RPP run is VERY SLOW. Most people can’t take the compliance course without getting errors and a LOT of the people that did take it…their back offices are telling them that they haven’t completed it. It says in the back office that it’s updated nightly. Not true, because I have many in my down-line and theirs are not updated. I don’t understand for the life of me that if something is broken, why don’t they fix it already! Everyday there are excuses. And why in the hell can’t they bill the credit cards for the monthly subscriptions (this is holding up so many folks commission payments). WE want our money!! Starting to make a lot of comments here ring true. Am I looking at the demise of Zeek Rewards? Zeek Rewards is something of an enigma. If, as they claim they are only paying out 50% of their daily profits to their qualifying affiliates and if those affiliates are being paid as much as they claim, there should be a rather sizable sum of money left over. Now if it were me and I had a ton of cash sitting there and a company with very severe customer service and website issues I should think fixing those problems would be a surpassingly high priority. They could hire enough customer service and technical support people to manage the problem and start adding server capacity in advance of need, but they aren’t doing that, are they? Paul Burks boasts of his 15 years of rock solid buisness experience but that was all trifling little programs on a just above broke buisness model run out of what is now a bank owned warehouse in Lexington. Fun fact, for the last decade every one of Paul’s programs had a way to earn money without ever selling a retail product to an end user who wasn’t also part of the program’s compensation plan. This is exactly the sort of thing that could have gotten him in deep trouble with regulatory agencies if he ever had made enough of an impact for those regulators to take notice of him. He never hit it that big until now. Paul was very good at and very comfortable with flying under the radar. I wonder how much out of his own element he feels at the moment? Sure, he’ll spend a ton of money hiring top dollar legal flack, they do after all add to his “legitimacy” but as I’m sure you have noticed he isn’t dealing with things in a fully rational manner. He could pay an outsourced call center to handle his customer service issues for less than he pays Kevin Grimes but extra support staff don’t win him the praise of the MLM industry commentators. His decision making process seems to indicate short term thinking. There is a well established and time tested list of signs of a ponzi apocalypse and Zeek is demonstrating most of them. Enough so that I find myself wondering if it might be by design. If Zeek had gone nine straight months where the website was live and functioning 99% of the time and pay runs went off like clock work and then they hit a major snag there would be some level of panic. And if they didn’t resolve the issue quickly that panic might start a stampede to the cash out window. But they have several website outages a month and just as many “slight delays” in sending checks out. When the “big one” finally does hit their member will have been so thoroughly inoculated to this sort of thing many of them wont believe their gravy train has come off it’s tracks for good. Paul Burks is the master of self reinvention, by the time his current can’t miss program sinks into oblivion he always has a fresh one ready to follow that one into it’s inevitable grave. That’s always how he’s worked in the past and I suspect he thinks he can do it again after Zeek. I just hope the Troy Dooly’s of the world are slower to give Paul the benefit of the doubt next time. @GlimDropper, they claim they are adding server capacity, but they seem to have more problems with the site now than they did before adding them. All the down time, people not being able to place their ads because they can’t get in the site. Then they set up a mirror site for people to place their ads and people are even having problems with that. Support is a joke. They supposedly have a live chat now and you can never get not one question answered. They always direct you to send in a support ticket. And I’m like, you idiot, I did months ago and no one answers. I thought your job was customer support. Support me then already. Then you call that 800 number they have, stay on the phone for an eternity and then you’re disconnected every time. Support tickets go unanswered. I have about 3 of them that date all the way back to February and they are still open. Lots of people are starting to get frustrated and this is the type of thing that will bring them to their knees. But like you said, maybe all of this was by design. Oh, I almost forgot they also have a Skype Room set up with a Compliance Manager there and her name is Marie. But everyone there is useless including her. All she ever tells you if you ask a question about something questionable…”let’s keep the room positive”. Oh shut up, I want answers! And then she throws the rules up in your face. NO ONE is forthcoming with information because most of them don’t know ****. Not sure about people panicking, because as you well know, sometimes people want something to work for them so badly and with the economical situation being what it is, they will hide their faces in the sand and continue to follow the cult until the poison koolaid kills them. I didn’t know much about Burks himself, but thanks for enlightening me :) I do remember the Free Store Club and most everyone I knew that was in it, didn’t make a dime. I tried to find some info on Dawn their COO, but was unable to find anything. Today we got news that they are having delays in their credit card processing for subscription payments. Now they want everyone to use an e-wallet system, such as AP, STP, etc. I find this very strange. Why on earth would a company claiming to be this big is having problems billing their distributors (in that Compliance Course we had to take, according to Kevin Grims, we can say membership anymore)?? Many legitimate businesses use merchant accounts without any problems so that’s a mystery to me. I thought the course was a joke because all Kevin Grimes talked about was how affiliates can’t say certain things in an MLM company. I believe what he says is true, but it still doesn’t change the fact that Zeek Rewards is an out right ponzi investment scheme. I have never seen so many people involved in something, and no one can explain TOTALLY how everything works. I don’t understand a lot about Zeek Rewards and haven’t found one person that was able to explain it thoroughly to me, including my sponsor. And some of these people are making a small fortune. I must agree with you. It is quite the Enigma and totally unglued. It’s time to take my money and run! First and foremost, if you recruited friends or family members into ZR and they joined because they trust and care for you, get them to get their money out. Then, if you’re not in profit do what you can WITHOUT recruiting anyone else, do what you can to get your money out. These can happen more or less at the same time but the big key here is priorities. Money and things are money and things, friends and family are friends and family. If you had any trouble deciding which was more important you wouldn’t be posting here. Paul is a “grinder,” or at least he was. All his stupid little “next big things” had no commercial viability and were only sustained by two things, weekly “rah rah” calls and a transparent pyramid scheme pitch which ensured that about the only sure way to make money off of his programs was to recruit other people to pay to join the comp plan (with a commission going to the person who convinced you to do so). The point of larger significance here is actually the rah rah calls. Paul et al. have the better part of a decades experience holding weekly calls playing puppet show theater of the greedy mind. They had to deal with issues like “why hasn’t what you promised us would happen not happened yet” and “after showing pathetically inadequate results in your last next big thing, why should I open my wallet for today’s next big thing.” Despite the fact that prior to Zeek every program Paul created was an abysmal failure for the vast majority of people who paid to join, the people who could recruit enough other people did turn a profit. These people were the seeds of his next venture and it wasn’t because believed in the new program but it was because they knew if they could recruit enough people with the new sales pitch they could make money. ~Some~ of that changed with Zeek Rewards. Paul finally hit it big but much like a puppy dog who chases cars down the street, once he caught one he had no idea what to do with it. He’s made more money in the last year than he’s made in the last decade but he’s also no longer a near anonymous internet bottom feeder. All he can do is all he’s ever done (with the addition of paying a bunch of attorneys who now owe him confidentiality over anything he’s ever told them), the same sort of lame excuses and vapid “you fine people” rah rah talk is all he can give you. It’s worked for him for well over ten years and he doesn’t seem to recognize he’s way out of his weight class. Thomas “Andy” Bowdoin was a low rent con man for most of his life and would have died penniless in obscurity but his Ad Surf Daily ponzi scheme caught fire making him rich and famous. Now he will die penniless and almost certainly in prison. Here’s a big hint to Paul et al, you don’t need attorneys (yet). The Kevin Grimes’s of the world can encourage your affiliates never to say the evil word investment but if they were ever to be honest with us they would say that if ZR does not meet the legal definition of an investment it doesn’t matter if the affiliates all call it one, it isn’t one. And if ZR does meet the legal definition of an investment it couldn’t matter in the least if no affiliate ever said it was, it still is one. If Zeek Rewards wants to end the issue, one way or the other and for all time, call the North Carolina Securities Division (919-807-2000) and throw open all your books and records and ask THEM if ZR is “in compliance.” This of course will never happen so I guess we’ll just have to take Kevin Grimes word for it (for now). It’s good to see you — and I am grateful for your participation in this thread. Patrick, you are far too kind my friend. Hang around, sometimes some of the best incites come from (soon to be) former members like yourself. A few of my favorite commentators around here used to be involved with ponzi schemes until they realized where their profits were coming from (they comes from other members like themselves). I can’t promise you fireworks before the 4th of July but I can promise you there will be fireworks.